Tonight: Clear. Cold. Lows in the upper 10s. 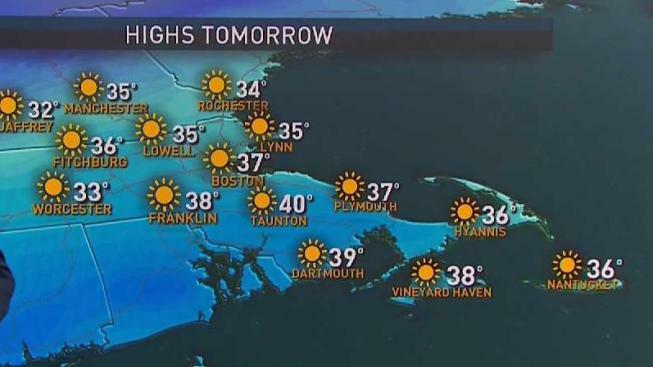 Tomorrow: Sunny. Chilly. Highs in the mid 30s. Tuesday: Increasing clouds. Chilly. Highs in the upper 30s. On Saturday we were hopeful that Nor’easter #4 wouldn’t deliver much more than a glancing blow. Unfortunately, there is a new trend we’re watching with the forecast models. It’s a snowier trend and it appears that the areas hardest hit during the last two Nor’easters could receive the most snow this time around. With a significant snowpack, spring flooding is a growing concern. The NOAA has been flying aircraft over New England collecting snow water data for the National Operational Hydrologic Remote Sensing Center (NERFC). The threat for river flooding is in the "Above to Much Above normal" for a majority of New England. We had a similar threat back in 2011 and 2015 when there was a substantial snowpack, fortunately those two years featured a slow melt with not much rain. Hopefully our active pattern turns quiet. At Boston Logan airport, precipitation for the month of March is already 2.52 inches above normal. It should also be noted that Boston has received above average precipitation in January and February, as well. Ok, let’s get back to Nor’easter #4. It appears a track closer to the benchmark is looking a bit more likely. Accumulating snow is looking more likely for coastal southern New England. Currently, it appears the heaviest snow would fall for the Cape and Islands. This forecast has been going back and forth for quite some time. At this point, be prepared for snow, but it’s too early to detail amounts and intensity. We might not be done after Nor’easter #4... number 5 is looking possible late in the weekend and into early the following week. Let’s get through the fourth before we go into any detail on the fifth, though!